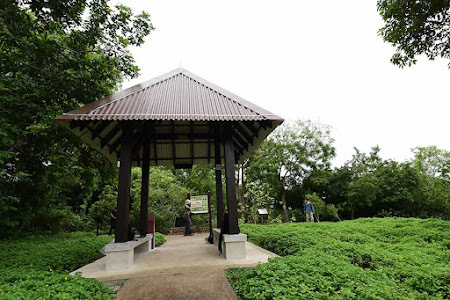 The annual celebration at Pulau Ubin for the fifth time since its inaugural start back in 2002 took place on 4 Jun this year. 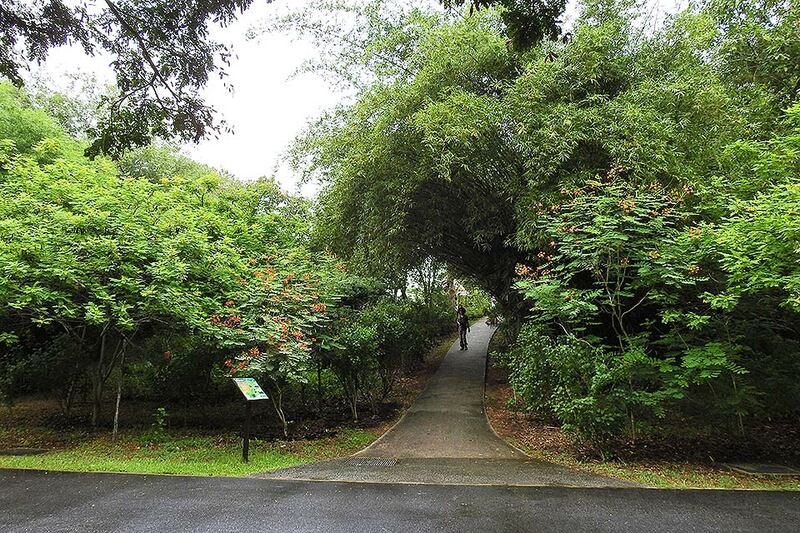 What is special this year, was that the celebration of all things Ubin expanded to a whole month! Pesta Ubin as it is called, featured many activities by various groups of volunteers from 14 May to 12 Jun. 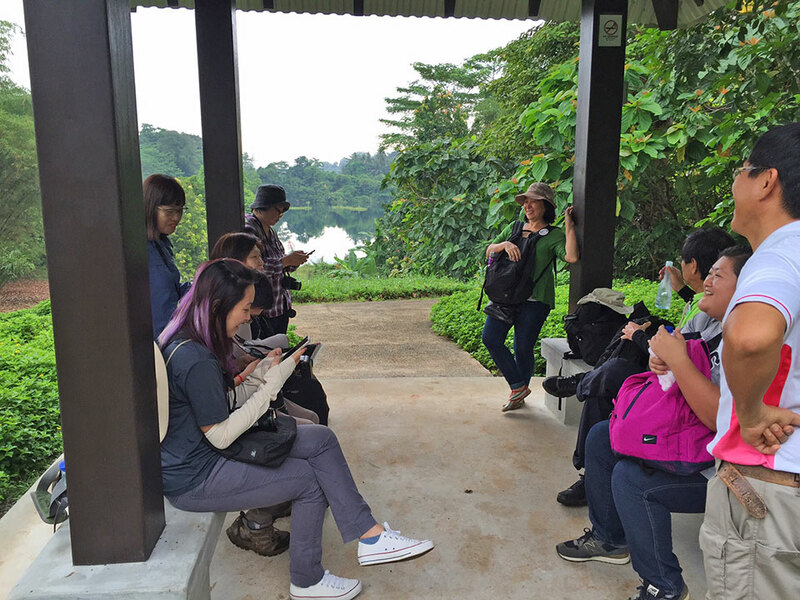 Pesta Ubin (roughly translated from Malay, means Ubin Carnival) showcased many activities from painting, coastal cleanups, night macro sessions, cycling and so on. The Pesta Ubin blogsite details most of the activities over the month. 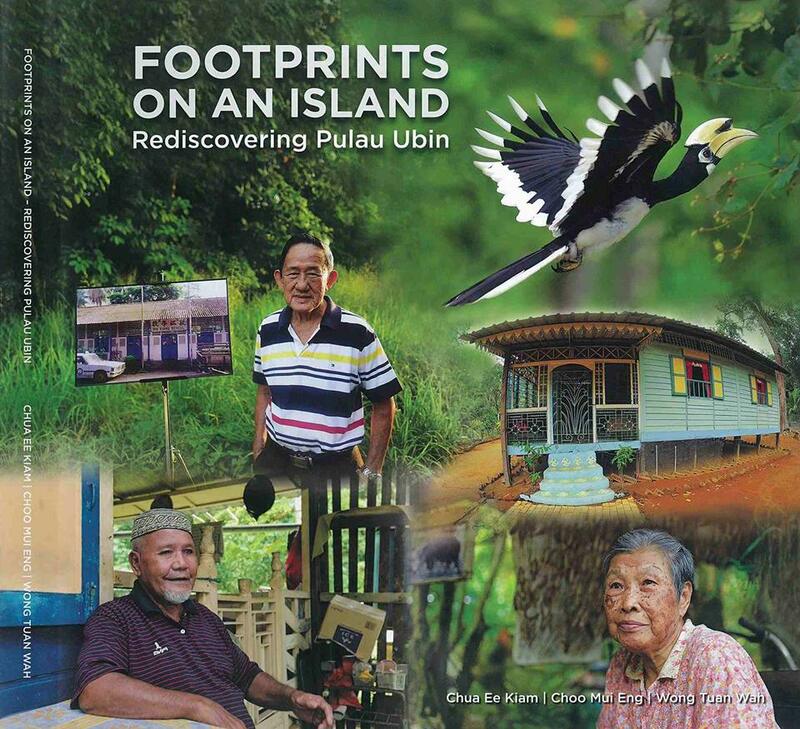 The brainchild of long-time Ubin activist Ria Tan and her gang of volunteers, this year's activities on Ubin island had a far greater outreach to members of the public, interest groups and anyone interested to know more about Pulau Ubin. 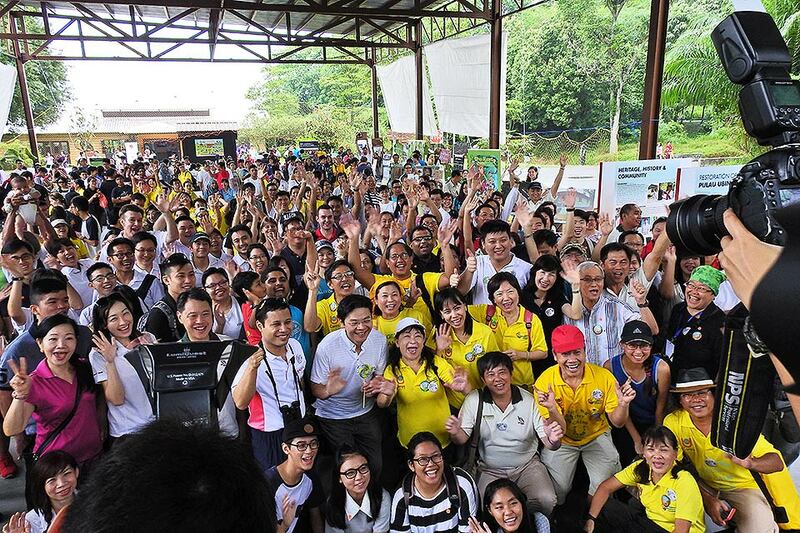 Ubin Day 2016 started with a lot of excitement as various volunteer groups set up their booths at the "town square". 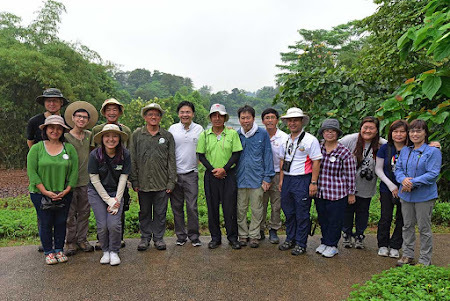 However, the weather this year wasn't as cooperative as previous Ubin Days, as the skies turned cloudy and it drizzled for most of the morning. 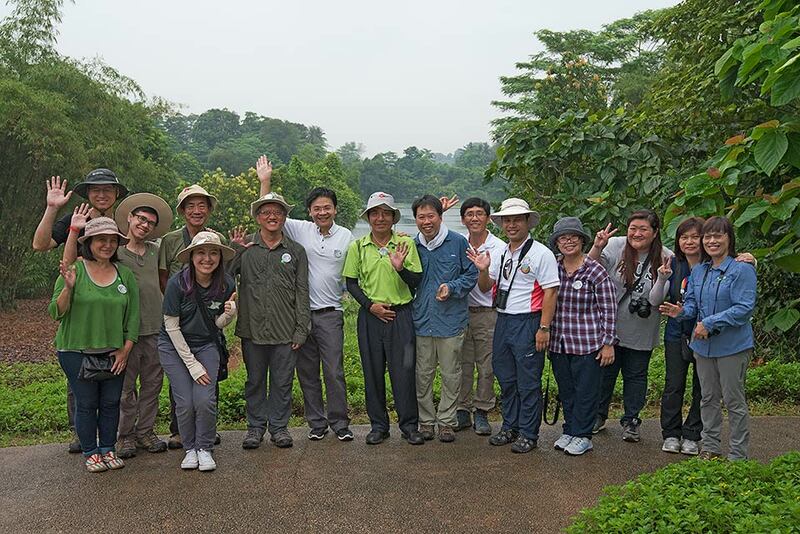 However, refusing to be dampened by the wet weather, the participants' enthusiasm ruled the day. 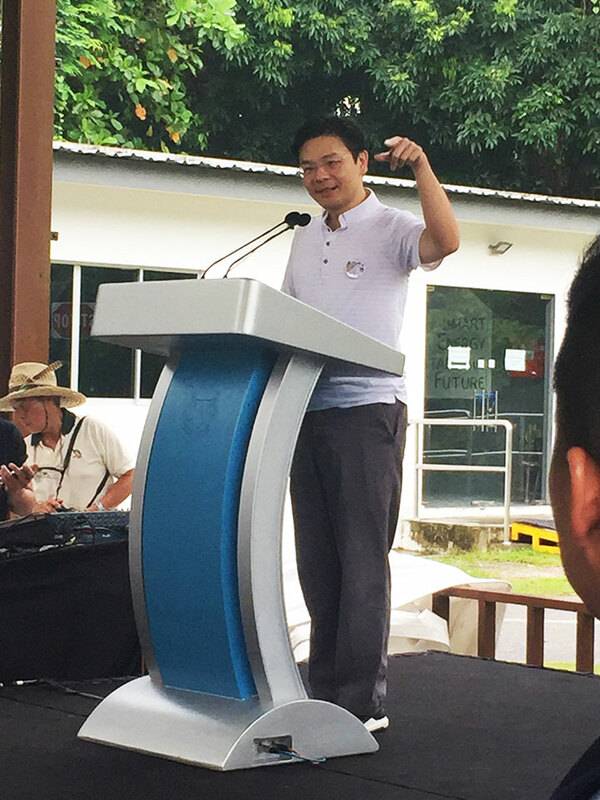 The Guest of Honour this year was the Minister for National Development, Mr Lawrence Wong. 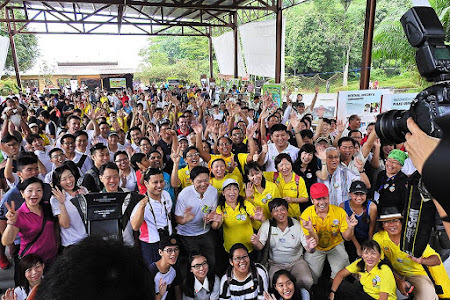 Accompanied by Minister of State Desmond Lee, who also spearheads the Friends of Ubin Network (or FUN) and the senior management of MND family, the enthusiastic crowd welcomed the MND VVIPs who arrived on time at around 9am. 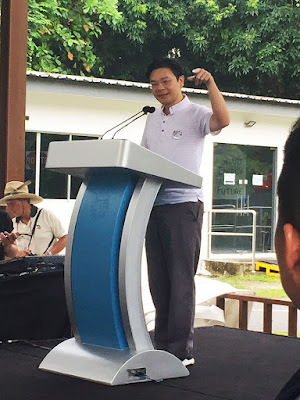 In his speech, Minister announced that NParks will be the central managing agency for Pulau Ubin. 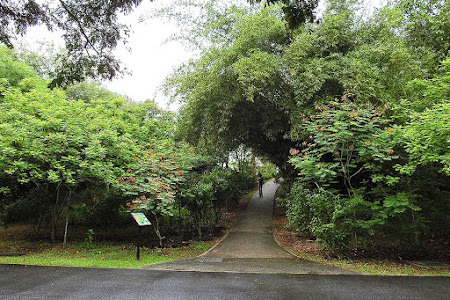 Previously, at least 12 government agencies oversaw various parts of Ubin, making it very confusing for the public who wanted to do something, but did not know who to approach. 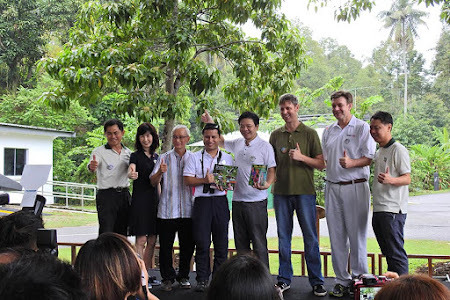 Ubin Day 2016 also saw the launch of two books. The first was Footprints on an Island, by dental surgeon, author and naturalist Dr Chua Ee Kiam, with co-authors Choo Mui Eng and Director Conservation of NParks, Mr Wong Tuan Wah. The other book was a children's book called The Hunt for the Green Boomerang by Neil Humphreys. 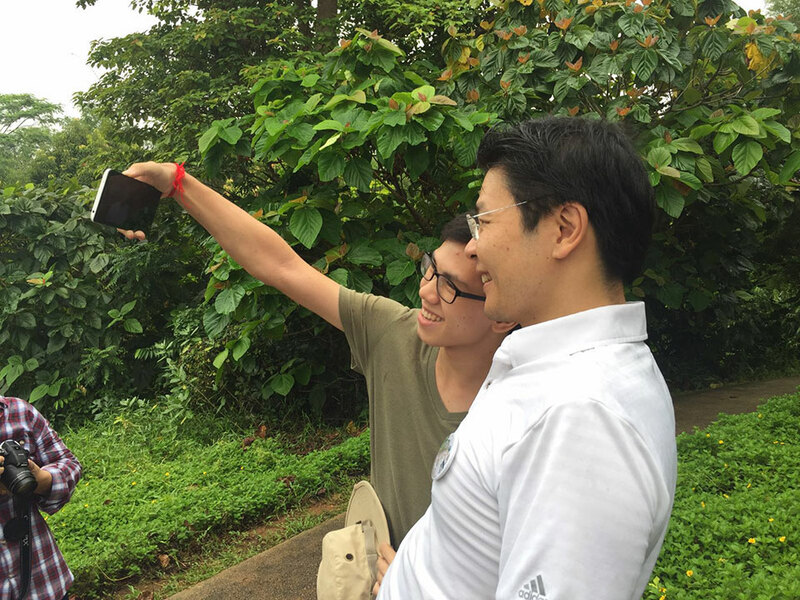 As part of his tour around the island, Minister stopped at Butterfly Hill. This hill was re-planted with butterfly-attracting plants back in 2005 as a conservation strategy to increase the butterfly biodiversity of an impacted site. Butterfly Hill is usually teeming with butterflies on ideal hot sunny days. 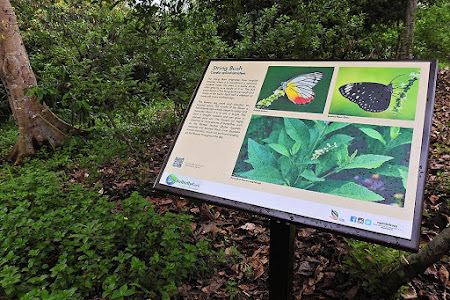 Unfortunately, the weather this morning was not conducive for butterflies as it was overcast and it drizzled intermittently for most of the day. ButterflyCircle and Seletar CC members were at Butterfly Hill to greet Minister and his entourage. 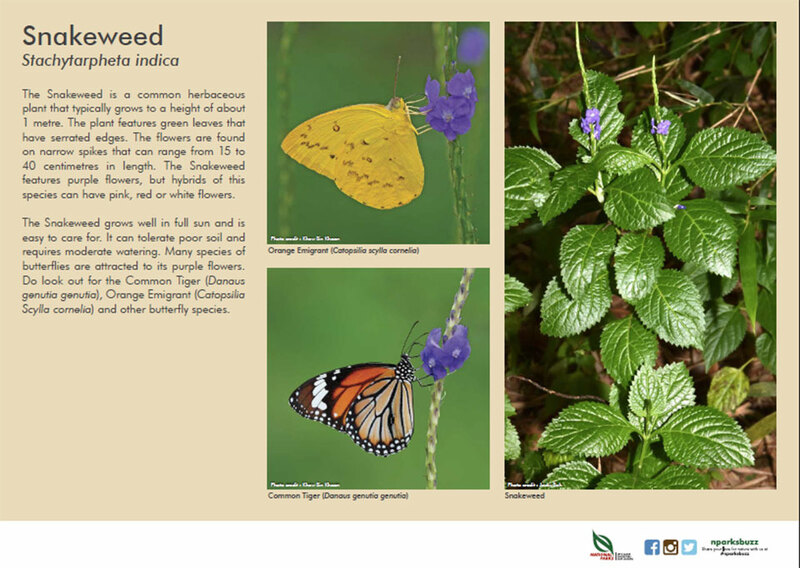 As the weather did not change, the butterfly activity was low, and Minister only got to see some Plain Tiger caterpillars on the host plant and a few butterflies that were still fluttering around in the cool balmy weather. 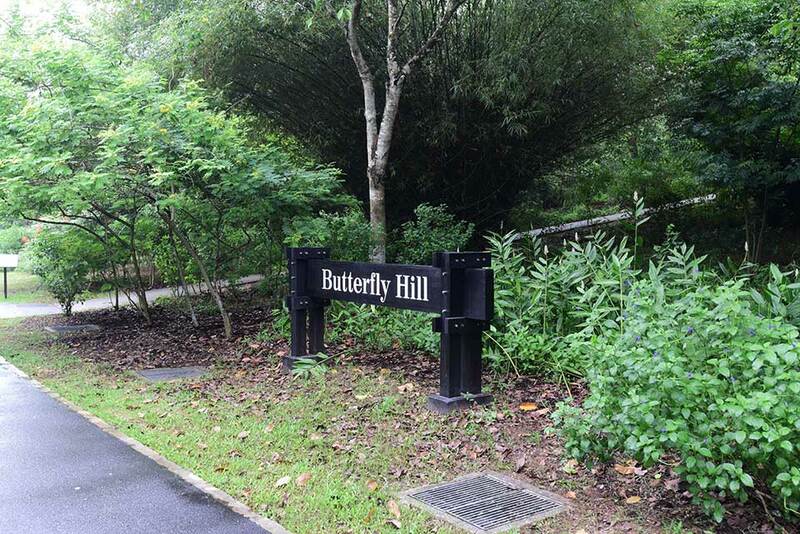 This year, ButterflyCircle assisted NParks with the upgrading of the signage at Butterfly Hill with over 12 educational signages that showcases the interrelationship between specific species of butterflies and their related plants. A large signboard featuring about 30 common butterfly species that are often spotted at Butterfly Hill was strategically placed next to the Tahu Hut where visitors can learn more about the butterflies that frequent the place. Minister also sportingly took selfies, wefies and the traditional group photo with ButterflyCircle and Seletar CC members who interacted with him. 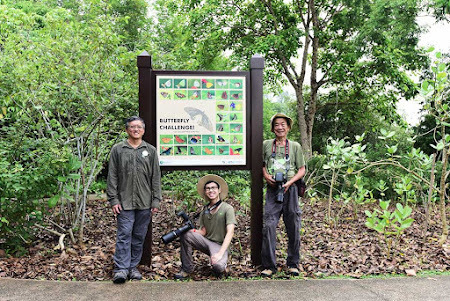 Although there were not many butterflies to photograph this morning, our members enjoyed the outing and the chatter amongst friends and butterfly lovers. The day ended after a "makan session" at the Volunteers' Hub and as the weather did not look like it was going to change, some of us bade Ubin farewell, until another sunnier day. 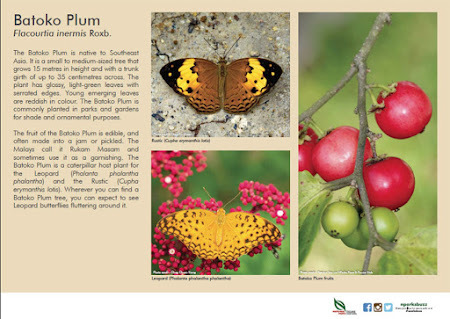 Text by Khew SK : Photography by Huang CJ and Robert Teo. Special thanks to NParks Pulau Ubin staff : Robert Teo, Jacky Soh, Choi Yook Sau and Leroy Alphonso for the collaboration on the ButterflyHill signage. 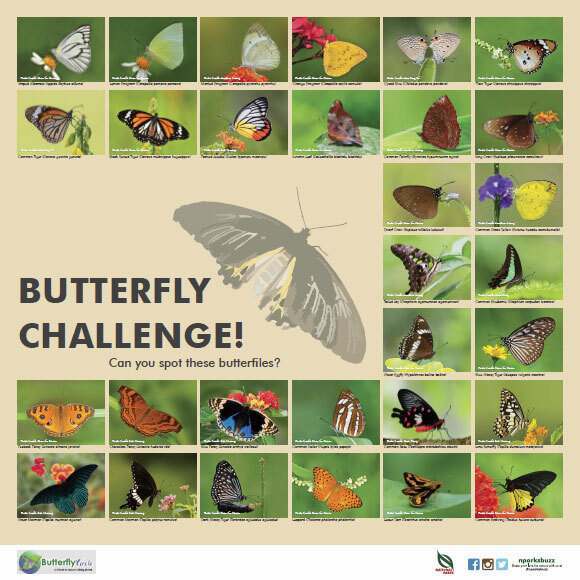 And to all ButterflyCircle and Seletar CC members for joining in the fun today.